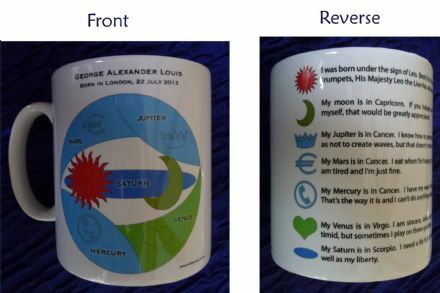 Supply date, place, time of birth and create an easy to understand astrological chart printed on a premium quality polyester 'cotton feel' apron a perfect personalised gift! We are delighted to have the opportunity to work with Jeanne-Elise Alazard, a renowned French astrologer, who has designed a unique visual way of simplifying and illustrating to the individual who is not an astrologer what the major influences in their life will be by using symbols to represent major planets. By giving your name, place, date and time of birth (time of birth is not essential) your individual chart will be designed and printed on an item of your choice to create the 'ultimate' personalised gift. A perfect idea for New Born Babies, Birthday's, Wedding Gifts, Christmas, Mother and Father's Day etc. Jeanne-Elise Alazard is a journalist and professional astrologer with more than 30 years experience. Her main goal has been 'to make astrology available to everyone'. She has written 2 books: 1 on astrology the other on morphology and has lectured around the world on international cruise ships and for Club Med. Her accurate daily newspaper horoscopes, radio and television work and endless list of magazine and internet articles make her one of Europe's most respected astrologers. 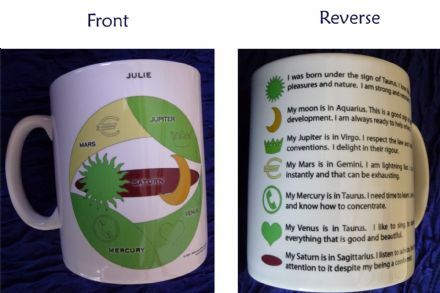 By inventing a new product called Astralazard she has made astrology simpler to understand and more fun and approachable for everyone.